We woke up to another ice rink this morning...I still like this better than 10 inches of wet snow though. We don't pay for a snow service, and all we have are a few shovels (I think one belongs to Mama Pea from her windstorm in February!) and a snow pusher. We do this work gradually but obviously would prefer not to shovel at all! I buy a new pair of cleats for my boots each fall because they never last the entire winter, the little cleat pin-thingies always end up falling off. They are a bone-saver that's for sure! I've been buying and wearing cleats every winter since 2001 when I found myself on my back with a broken left wrist to deal with. So this morning taking the dogs out, I was very grateful to have them on! The poor dogs were slipping a lot though. The huskies have furry feet and we don't trim that hair until the spring because they need it to keep their paws warm, but it makes for slippery exploring! But quicker than I could say "Wacky weather we're having..." the skies cleared, the sun came out and the ice started melting. Just a few hours ago I saw the moon rise. 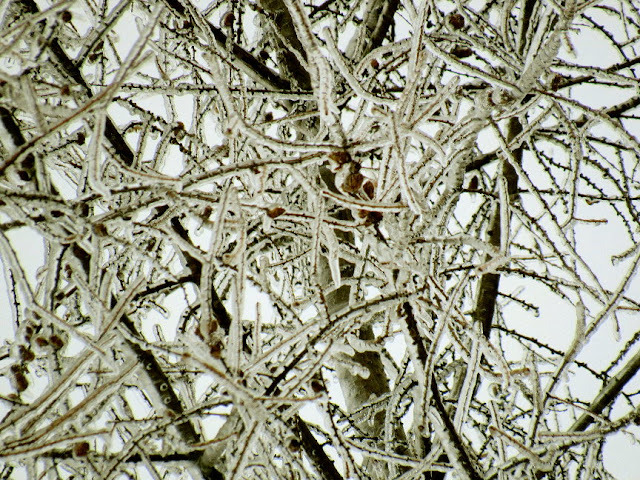 Two years ago, my boyfriend got me a wonderful camera for my birthday, I love the optical zoom. It's a waxing moon and it'll be full on the 12th I believe. Does anyone "moon garden"? Planting seeds by the cycles of the moon depending on what crop you are planting? I've been reading about it and it looks really interesting. I'm almost all organized from Monday's shopping extravaganza! The freezers are packed and organized, the cupboards are too and I have an inventory list written out. 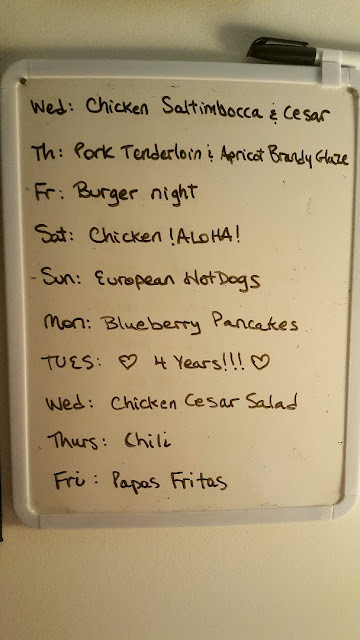 I have this dry-erase board by the kitchen with the upcoming meals so my boyfriend can anticipate yummies :) and so I can have a quick look to see if anything needs defrosting or preparing the day before. We go through SO MUCH yogurt...I had to make more already this morning. The dogs get some in their dishes each morning too, mostly for the husky's health, being girls! I eat some every day with maple syrup...I need more maple syrup... :) Love the stuff! 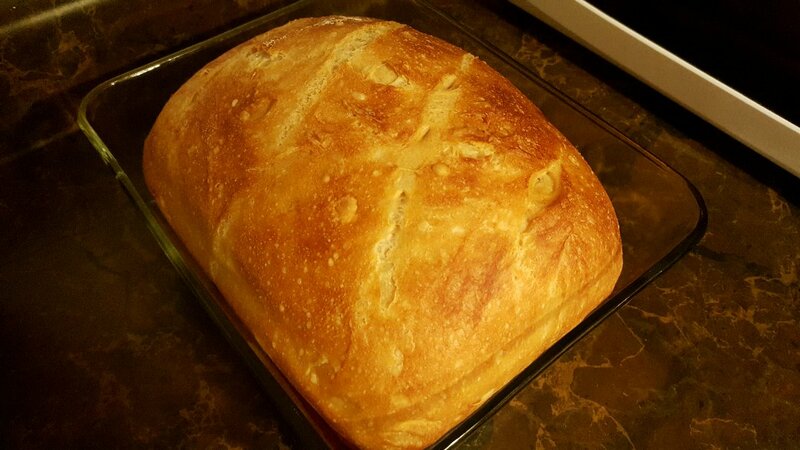 And I baked my bread this morning too. I have a great recipe for No Knead Bread. You start it one day then let it sit in the fridge overnight, it makes it super fluffy and moist on the inside with a nice crust on the outside. It's our "go to" bread for nearly everything. I do always keep a loaf of POM bread in the freezer for club sandwiches and sometimes for grilled cheese if I have no bread made. We had the leftover Mac and Cheese for dinner last night, THIS time I remembered the bread crumb topping! 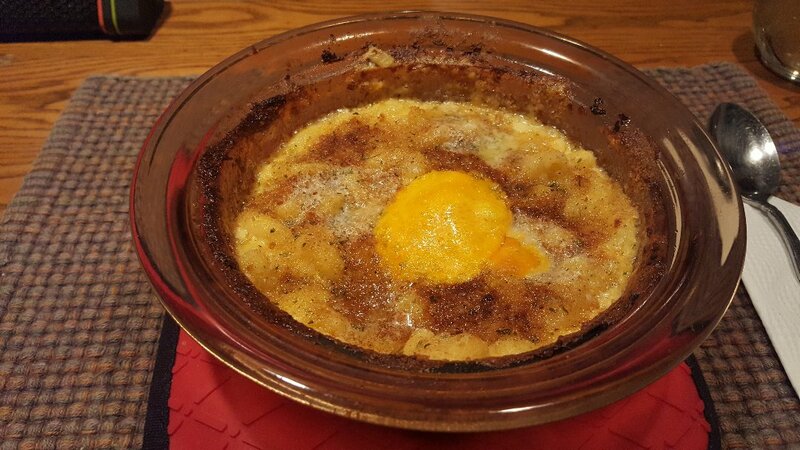 And what looks like an egg on there is just a plop of Cheddar that was leftover from last shopping day! I havn't made joghurt for a while since my little foster goat is sucking up all of Tillies milk. I will soon tho ... now that I am going to start weaning. I really gotta invest for those spikey thingies for my boots for next year. We've had a terrible icey february ... we could skate on our driveway all the way to the barn. Your bread looks delicious. G is on a strickt no gluten diet again so I am avoiding to make bread ... it is just too tempting for him. Oh gosh Nik, I do hope my blizzard days are over for this season...but you just never know so I'm trying to NOT get my hopes up for spring! Those cleats are such a rip off at $22, at least at Canadian Tire. Each year they go up by a few dollars but the quality doesn't. I don't have much choice though because I've tried other ones over the years, and those are the best of the lower priced batch. I'd love to get the big ice fishing cleats, you know like you can climb an ice mountain in them??? But those aren't too practical for walking the dogs lol...Too bad G can't handle the gluten, I remember my gluten-free year and I really missed a lot of the foods I love to eat. that hammock looks great. 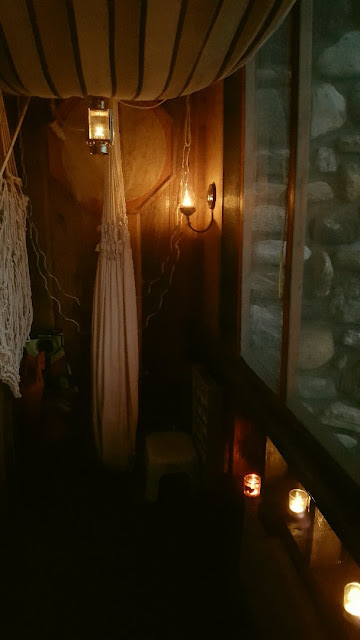 what a cozy place! i am so excited...we are supposed to get some snow tomorrow night! i had almost given up. these last two winters have been losers! Hi Joyce, I'm glad you're excited about the snow, I have had enough of it though! :) We did get a lot in January and I nearly called the snow removal guy in desperation, but I'm glad I didn't give in!! Love your prose and pictures of every day life. I need to make time to "smell the roses" and depict more of our every day life because it is pretty great and I appreciate it more and more all the time. We had an even bigger wind storm yesterday. Winds gusting up to 55 mph. I don't know what's going on around here, but I don't like it. Lots of little things blown around and the top of a big spruce snapped off and fell across the driveway. P.S. I want my shovel back. What a beautiful room! Your menu makes me hungry and I used to make my own yogurt but the doc told me to stay away from milk products...how I miss the yogurt! I too loved maple syrup with walnuts too. I tried honey and that was good but the syrup was the best! I also make the No Knead Bread. That is a gorgeous picture of the moon. 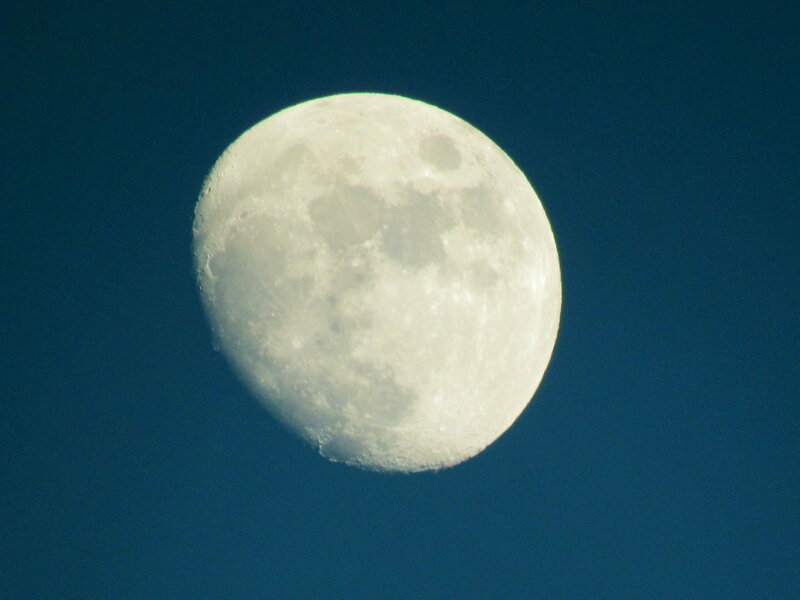 I've tried but I have a Kodak which just doesn't do it when it comes to the moon. I have the exact same magnetic whiteboard on my fridge too but I use it to jot down when I run out of something. Living alone doesn't require a menu plan! LOL! I have Yaks that I leave on an old pair shoes but I can't believe the elderly down here never heard of them and they're from the North! It looks like you have a very wonderful man in your life! I am not a romantic....well, not any more anyway! After 2 divorces and 21 years of marriage that was enough for me! LOL! But I'm happy for you and you are still young! I really like your marker board for menus. That's an excellent idea; I'm too often scrambling at the last minute to figure out what's for dinner! And I'm going to have to try your bread recipe. 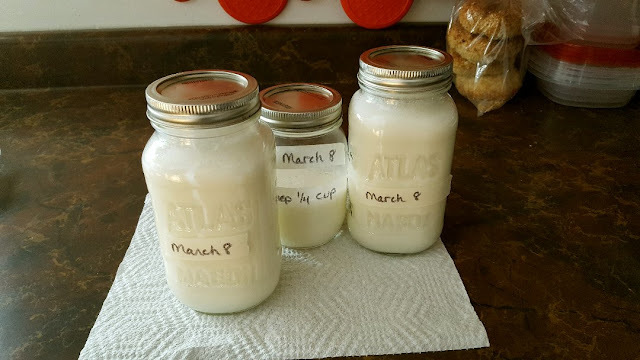 I didn't realize that refrigerating overnight would make such a difference! I need to make yogurt next week. I have so much going on right now, and I just want a night (or day) to play. I use a board on my fridge for meals for the week too. The kids like to write strange things on it to throw me off. Thanks Mama Pea :) What shovel??? ;) That's what blogging is for right? 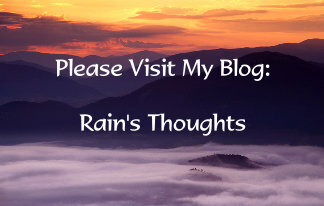 To dedicate your writing and stories and photos of your every day life! Hollywood is boring, I like reading about REAL lives. It's inspiring to me how people get by and cook and live on homesteads etc...we got your wind last night, it's bringing a nasty cold front here again. Hi Sam :) Thanks for your comment! We got lucky that this rental had the upstairs balcony. The view isn't anything to write home about, across the street there is a duplex, but the ladies who live there are quiet. This spring we're going to put up some sheer curtains to have a little more privacy. In the summer, when people walk by they tend to look up and comment that they see a hammock lol...Oh that's really too bad about the milk products. Is goat milk out of the question too? When I did my vegan year, I tried soy yogurt, but it really didn't do it for me. It's funny you said after 21 years of marriage, it was enough for you. I lived alone for nearly 19 years so now I'm really enjoying and needing that romance! But during those 2 decades, I didn't want any of it. :) If I didn't have those little cleats, I'd be homebound. 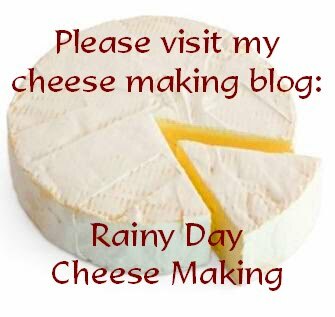 Thanks Leigh :) I've made other bread recipes, but this one is a keeper. At first it seems like a lot of work, but it's just timing. No kneading is what got me interested! It's hard not to eat it with a load of butter on top just as it comes out of the oven though. :) The dry erase board is wonderful. I have one on my fridge too, like Sam I Am does because everytime we take something out of the cupboard or use up something in the fridge, we jot it down for the next shopping list. It makes life so much easier.